It’s so lovely to have old friends on our 300th blogpost! 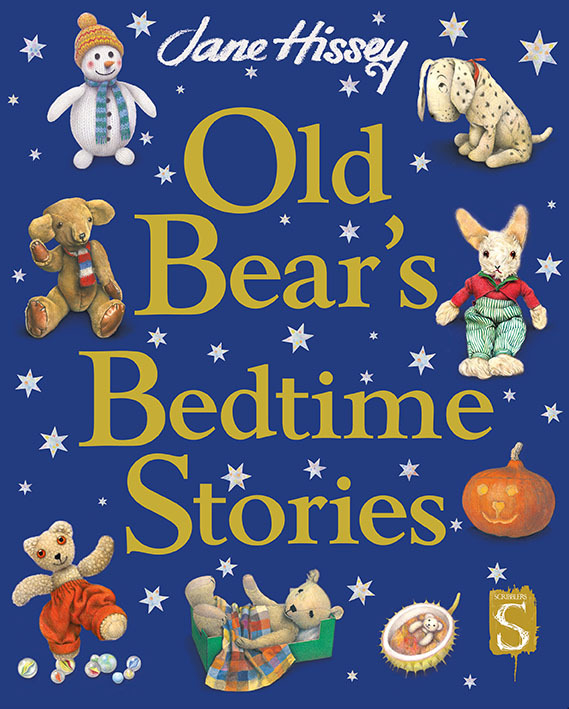 It is no secret that we are huge Old Bear fans and we have been eagerly awaiting the arrival of Jane Hissey’s newest book, Old Bear’s Bedtime stories. This collection of stories and poems introduces new characters as well as old friends and familiar faces and we enjoyed the stories so much that we had to keep reading ‘just one more!’. This is definitely a collection that we’ll keep coming back to. The book is a sturdy hardback with a cover that shows many of the characters from the book. Old Bear, Little Bear, Ruff, Duck and Bramwell are joined by Spotty Ben, The Warm Snowman and Toby Small. The stories are the perfect length to be read at bedtime (although we can’t restrict ourselves to just one!) and they include a range of familiar childhood experiences and seasonal activities, Old Bear and friends go on a winter picnic, new characters Flossie and Ginger have a day at the seaside and we are introduced to Peter and his Pumpkin Bear. There are also two Christmas stories, as an adult I enjoyed the humour in the text when Rosie and Fluff dressed up as Holly Bears although the joke wasn’t apparent to my daughter! Despite the introduction of so many new characters my daughter’s favourite character is still Little Bear and I have always had a soft spot for Rabbit, there’s a wonderful illustration of him dressed as a snowman for the Fancy Dress party. We have spent lots of time looking at the new bears and other toys which are introduced in the story, my daughter likes the picture of new rabbit Lucy in her blue dungarees and I love the way that so many of the toys look well loved and slightly worn. There is never a shortage of action in the playroom and Jane Hissey has given ordinary experiences a fun and imaginative twist. There are often problems to be solved – What do you do when somebody plays bagpipes first thing every morning? How can the toys make sure that they don’t end up in the jumble box? What do you do when you need a new nose? There is also lots of delicious food and parties are thrown for several different occasions. We found it very difficult to choose favourite stories or poems but we decided that The Three Bears was our favourite story. Old Bear, Bramwell, Little Bear and Rabbit re-enact the story of Goldilocks and Bramwell even makes porridge for the play. Rabbit makes a wonderful Goldilocks with his yellow curtain fringe hair although the porridge doesn’t have the same soporific effect on him that it does on Goldilocks! Jane Hissey’s characters make so many simple childhood experiences interesting and exciting and we love the way that the toys use their imaginations and objects from their immediate surroundings to create their own fun. Thank you to Scribblers for sending us a review copy of this beautiful book. We really enjoyed Old Bear’s Bedtime Stories and think that the book would be a beautiful present for a new baby or a christening. How much do you know about Old Bear and his friends? Find out in publisher Salariya’s Old Bear Quiz. I’ve never heard of these stories before but I’m going to look out for them #PoCoLo. Maybe perfect for my niece for Christmas ! Oh this sounds like such a lovely book! I do like bedtime stories.